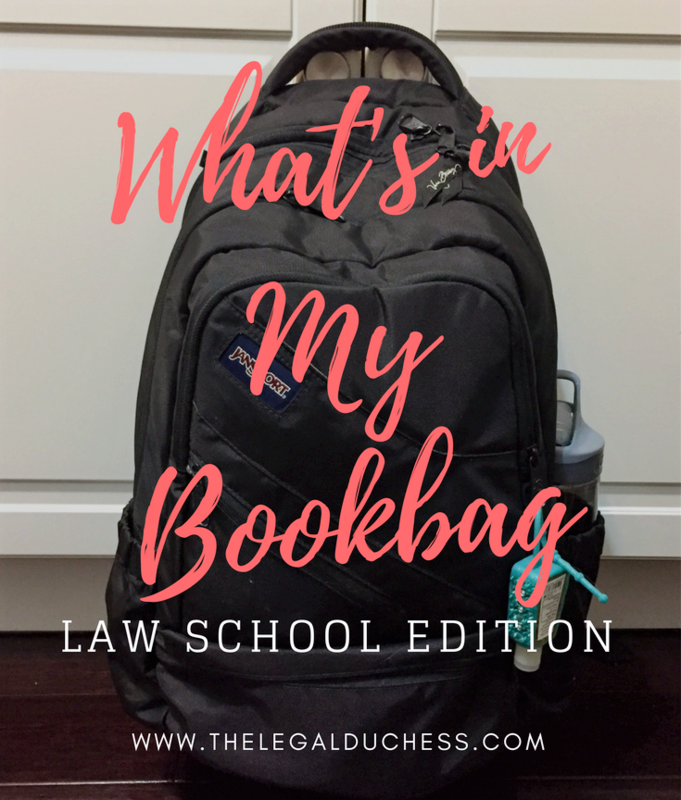 I have had several people ask for a "what's in my bookbag post" so here is it: Law School Edition! I, of course, carry the necessary casebooks for each day. They weigh a ton but are completely necessary. I rent or buy my textbooks from amazon- much cheaper and with an Amazon Student Prime account, usually I get free 2-day shipping! Love it! My new habit is having a binder for each class and I have tabs inside for class handouts, notes, case briefs, etc. I take my class and reading notes on reinforced loose leaf paper and fit them into the overall flow of my notes after class. I LOVE my Plum Paper Planner- it is a lifesaver during school and it is never not in my bookbag. I am also a huge pen snob so I carry enough to help a small army write letters. I have Pilot G-2 pens in a million colors, Sharpie Pens, Gel Highlighters (the BEST thing for thin casebook page highlighting) and some pencils. Because I take color coded notes in pen, I keep a little white-out dispenser in my pencil bag for mistakes. I also carry a small flashdrive in my pencil case for printing things at school and backing up assignments. I keep a variety of random crap in my bookbag for those random emergencies. I have a Pinch Minimergency kit which is small but has a ton of options. 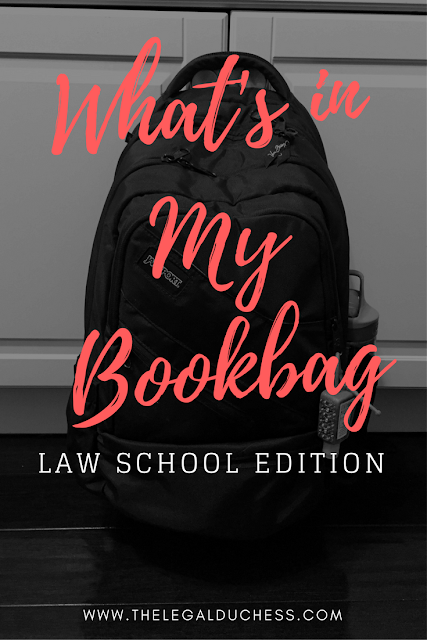 I also keep Ibuprofen in my bag because Law School inevitably gives me headaches (and my classmates are always coming to me for it). I always have an Eos Chapstick and Handcream in my bookbag because the building is notoriously dry and I am constantly reaching for chapstick or putting lotion on my hands. I keep a charger (not pictured) and a power pack in my bookbag for those long days on campus. I have various sticky notes because sticky notes are just 110% necessary to life. I also love this little to-do list pad for when I sit myself down in the library to outline what all I need to get done. I tend to be messy so I keep some wet ones in my bookbag just in case of a coffee spill. I carry my computer and charger in my bookbag. I have a small, lightweight computer that is great for carrying around. I do not take notes on my computer (I retain more by handwriting my notes) but I use my computer in between classes, if I forget my book (casebook connect for the win) or whatever other reason. I got my bookbag at TJ Maxx a few years back and I LOVE it (similar). It is sturdy, has tons of space, comfy to carry and a nice laptop area. I suggest a heavy duty bookbag for Law School- casebooks are heavy. Something that is comfortable to carry is also great because you will be lugging it around a lot. What's in your Law School bookbag? I love your blog! Thank you so much for taking the time to tell us about your experiences :) I love the plum planner idea...could you go over how you designed yours at some point? Such as, which size fits best and what add-ons you think are good to include. Thank you! Thank you so much for your kind words and I am so glad you enjoy the blog! First You got a great blog I will be interested in more similar topics i see you got really very useful topics, i will be always checking your blog thanks .